Gulab jamuns are one of the most popular Indian dessert. It can be made with paneer, mawa, milk powder, etc. Here is one another variety of gulab jamun. It's made with sooji / rava/ semolina. 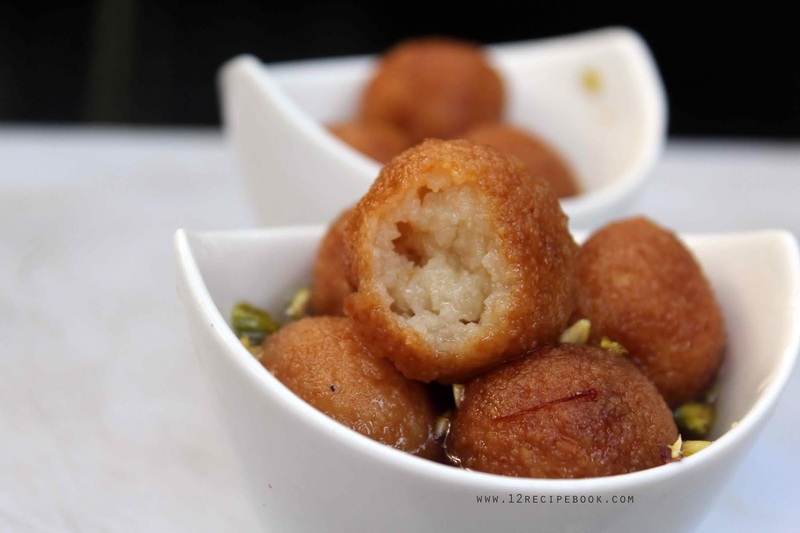 It's super simple than any other gulab jamun recipes. Try it out and leave you valuable feed backs here in the comment box below. 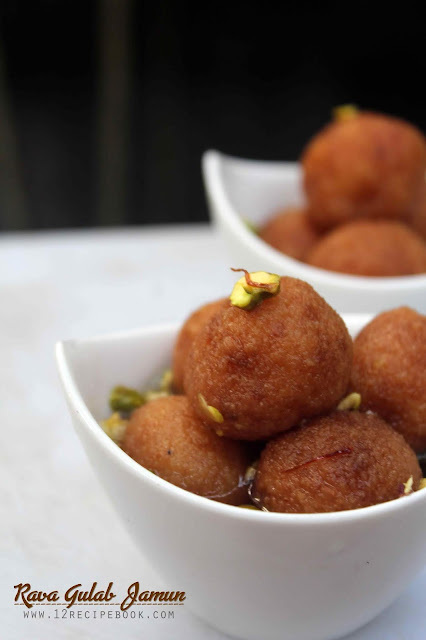 Check out the video of making rava gulab jamun to ease your cooking. Also please don't forget to Subscribe my You Tube channel: 12recipebook. Heat a pan with rava and dry roast on low flame for 3 minutes. Mix it until forms a dough and leaves completely from the sides of the pan. Allow to cool little and transfer in to a well greased (with ghee) plate. Knead to soft dough with your greased hands. Take few portions from the dough and make smooth balls without any cracks. Prepare all the gulab jamuns in this way. Heat a pan with enough oil for deep frying. Fry the gulab jamun's in medium flame until dark golden in color. Now prepare the sugar syrup by boiling sugar and water for 5 minutes; add saffron strands also. Add the fried balls in to sugar syrup and cook for two minutes. Turn off the heat and cover it with a lid; Soak them in syrup for an hour. Serve by garnishing on top with slices of pistachio.